Easter, one of our favorite holidays, but not just for the chocolates and jelly beans—we also love the beeswax-decorated eggs. Yep, you read that right. 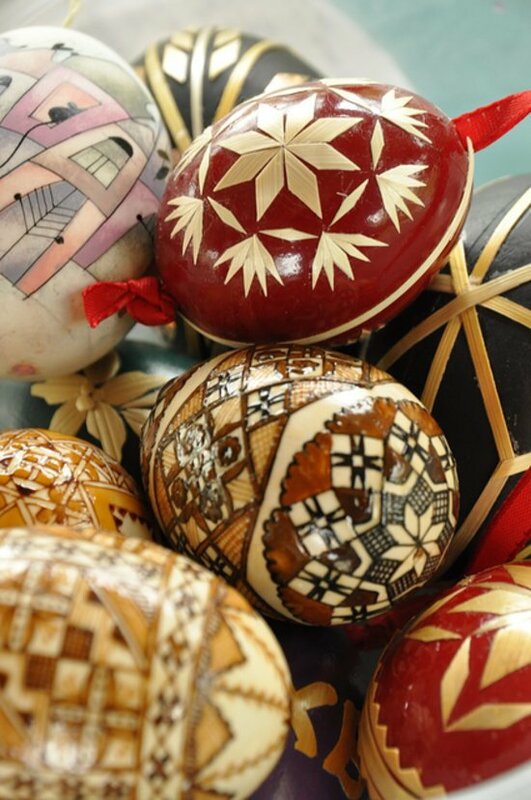 In fact, it's a centuries-old art of Polish pisanki and Ukrainian pysanky—a wax-resist method (a painting technique that makes the most of the fact that oil and water don't mix when painting) of decorating Easter eggs, much like batik. 1 Allow a white, uncooked egg to reach room temperature. 2 Wipe the egg down with a solution of 1/2 c. water and 1 tsp. vinegar. 3 Dab the egg dry with a tissue. 4 Draw your design on the egg lightly with a pencil. 5 Hold the head of a "kistka"—a copper stylus—over a candle flame for a half-minute or so. 6 Use the heated kistka to scoop up a bit of beeswax. 7 Melt the wax in the kistka over the candle. 8 Draw the melted beeswax over the pencil design for the first color. 9 Put the egg into the lightest color dye for around 15 minutes. 10 Use a tablespoon to fish the egg out of the dye. 11 Dab, don't wipe, the egg dry. 12 Continue waxing and dyeing from lightest to darkest color dyes. 13 Hold the dried egg under a hair dryer to heat the wax. Wipe it off with a tissue when the wax looks wet. 14Let the egg dry on a stand made from three finishing nails poked up through a piece of cardboard.